Wired reported yesterday (23/01/08) Last.fm the social media site "now lets users play any song from the Big Four record labels and thousands of indie labels and artists up to three times, for free." This would make Last.fm "the first website to offer free, global, on-demand access to the largest licensed catalog of music." The labels will include Sony BMG, Warner Music Group, Universal Music Group and EMI Music (the big four) and Ioda, Naxos, The Orchard and about 150,000 indie labels and bands. imeem had announced a similar offering last month allowing users who have registered with their site to listen to music for free. The contracts upholding Last.fm and imeem and their ability to allow us bloggers and alike to stream music for free cover new territory in the music industry. Pay-per-play flat fees, ad revenue, a mixture of both. I can only imagine what the contract departments in these companies are going through right now. Whatever they are thrashing out behind the scenes, the end result for us users/bloggers and for emerging artists would on the face of it appear to be quite promising. More music to listen and blog about for free. According to the article on Wired's website, "Any independent artist can submit their music to be part of the site (Last.fm), and will receive undisclosed standard fees with no label deduction", "more than double the payment artists get from commercial radio in the UK" according to Felix Miller, co-founder of Last.fm. What are the main differences between Last.fm and imeem? (A few moments later...) OK here is the alert you get after three plays (I choose Sunrise by Yeasayer). So now I can go to itunes or Amazon for example to buy the song that I can't get enough of. So how is imeem different (for the time being)? Well imeem facilitates users to interact with each other by posting and sharing music (and other types of media). 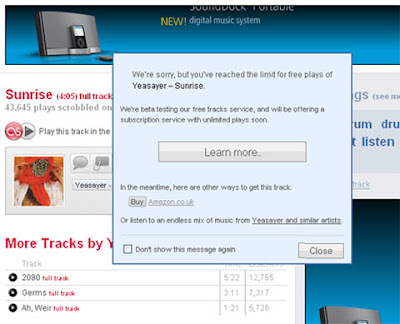 So if I want to listen to this song, I either buy it or I go to Yeasayer's Myspace page and listen for free. So at the moment Last.fm chooses the music it uploads and you can listen to it three times (or potentially more if you choose to delete the cookie it stores on your computer) and imeem decides who owns the tracks uploaded by the public and according to contracts they have with record labels, decides whether you get to listen to the full track of thirty seconds worth (if you didn't upload it yourself). I want the artists to earn money for their hard work and that's why I encourage readers of this blog to get out there buying the albums and going to the gigs. 2008 will certainly be a test for these new music industry distribution frameworks. It's all very confusing and I need a cup of tea. Maybe I'll pop down to my nearest record shop to get some fresh air and meet some people with new opinions -argh shucks, forgot, the local record shop is closed down. I would love to hear what you all make of sites like last.fm and Imeem, please leave a comment if you have a moment and please feel free to correct me or add extra info if I've missed details or got them wrong. Thanks for this good informative post. The music industry is changing for good am I'm curious to see what will come of it all. I quite like iMeem. It's an interesting time and I'm not sure anyone has a clear idea of which way is forward. Technology seems to be forcing it's hand and I guess we're benefiting for once. The music industry will always make money, maybe just not quite as much as it has in the past-it's so hard to predict. Last fm and lmeem changing the habits of the music industry blog is very nice and halpful in imeem music.This is a informative post.thank for this nice post.